BOOM! Studios is proud to announce WILD’S END: JOURNEY’S END OGN (original graphic novel), the conclusion to the celebrated, anthropomorphic, sci-fi graphic novel trilogy, in stores June 2018. Written by Dan Abnett (Guardians of the Galaxy, Aquaman Rebirth) and illustrated by I.N.J. Culbard (Doctor Who), WILD’S END: JOURNEY’S END reveals powerful acts of humanity persevering in the face of war on a worldwide scale. Despite the military’s best efforts, the alien invaders have seized a firm grip on the world. Cities have been invaded and the countryside overrun, leaving little hope for humanity’s resistance. With few options left, the survivors will need to look to the very people they once feared to make a last ditch effort to turn the tide of the war. WILD’S END: JOURNEY’S END is the latest release from BOOM! Studios’ eponymous imprint, home to a world-class group of licensed comic book series and ambitious original series, including Mighty Morphin Power Rangers, Planet of the Apes, Big Trouble in Little China, Victor LaValle’s Destroyer, Mech Cadet Yu, Grass Kings, and Klaus. 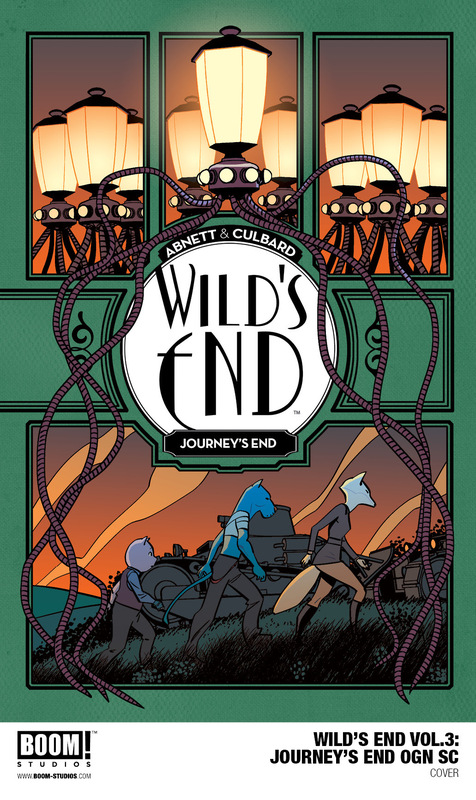 Print copies of WILD’S END: JOURNEY’S END will be available for sale in June 2018 at local comic book shops (use comicshoplocator.com to find the nearest one), bookstores or at the BOOM! Studios webstore. Digital copies can be purchased from content providers, including comiXology, iBooks, Google Play, and the BOOM! Studios app. For more on WILD’S END: JOURNEY’S END and other projects from BOOM! Studios, please visit www.boom-studios.com and follow @boomstudios on Twitter.